If you are endlessly tired, irritable, have trouble losing weight, or feel depressed, you might be suffering from the environmental onslaught of toxins being poured into our air, water and soil by greedy corporate monopolies. If you aren’t sure whether you are suffering from toxic overload, you can at least be certain you are not immune to the toxic effects of environmental pollution like oil spills, fracking, chemtrails, nuclear energy (think Fukushima), or even the domestic production of war materials. Even every day items like shampoo and rug cleaners also contain thousands of chemicals that are deadly toxic in higher dosages. 1. Support the liver and gallbladder with beetroot. Beets are a valuable source of iron, magnesium, zinc and calcium which all support healthy detoxification and better elimination. They are also full of B3, B6, C, and beta-catoene, important nutrients for supporting the liver and gallbladder in making bile acids which support detox. 2. Drink more purified water. Water is one of the most vital ways of self-purification on the planet. It helps every single cell get rid of waste and allows us to excrete toxins through our urine and bowels, as well as through our skin via sweat. 3. Bathe in Kaolin clay or use acalcium montmorillonite clay as they are considered the best for removing pesticides from the body. 4. Reduce your meat and dairy intake since these animals are often fed on GMO-rich diets. 5. Consume more pantethine, a biologically active form of the B5 vitamin, which can help open blockages created by pesticide consumption. 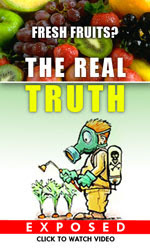 When we are too clogged with pesticides our bodies cannot naturally detoxify themselves. 6. Use activated charcoal. It is very safe to consume up to 20-30 grams a day mixed with purified water. Activated charcoal binds to pesticides and other environmental toxins and then ushers them through the intestines to be purged form the body. You can also supplement with molasses after using activated charcoal just to be sure to replace important minerals the charcoal might leech from the body in the process of getting rid of the unwanted toxins. 7. Eat more citrus. Pectins in citrus are a very powerful detoxifying substance. Citrus naturally remove heavy metals without depleting the body of important trace minerals. 8. Create an alkaline state in he body by eating more organic fruits and vegetables that support multiple channels of detoxification in the body. There are a variety of alkaline water benefits, including cleaning the liver, the bowels, the skin, the blood, etc. 9. Eat more fiber. When we eat fiber, the liver can more easily flush toxins through the digestive system and we take an immense load off an organ that is constantly trying to get rid of toxic substances from the body. High fiber foods include fruits, vegetables, whole grains, potatoes (including their skin), etc. 10. Eat more grapefruit containing naringenin, a special flavanoid that helps the liver burn fat instead of storing toxins in our fat cells. 11. Eating garlic can help boost detoxification since it helps to boost the production of white blood cells, otherwise known as lymphocytes, an important part of the immune system as well. 12. Eating asparagus can educe the levels of pesticides in the body. 13. Eating organic, free-range eggs can also help to remove toxins from the body. They also boost energy levels. 14. Increasing your levels of vitamin C is so good for you, and detoxing the body that it was found this vitamin could help reduce levels of radiation exposure, even in people who were living near Fukushima. 15. Native Americans have been using sarsaparilla for hundreds of years in teas and tinctures as a way to effectively detox the blood. It also effectively treats liver, kidney and skin conditions. 16. Exercising and staying active is vital to keeping impurities out of the body. Just 30 minutes to an hour every day brings oxygen rich blood to the liver and kidneys, thus supporting them in detoxifying the body. 17. Eating brazil nuts, which are full of glutathione, a natural detoxifying substance, can help the body get rid of pesticides and other harmful toxins. Also, full of selenium, Brazil nuts help to create more glutathione. Sometimes called the mother of all antioxidants. 18. Our skin is one of the biggest organs of detoxification. It covers about 22 square feet and we replace skin cells every single day. Dry brushing is a great way to help support the skin in detoxing the body through sweat, bathing, etc. If our pores are clogged, the skin becomes less effective. Dry brushing also helps encourage lymph flow that helps to flush toxins from the body. 19. Take Milk Thistle. Sylibum marianum, also known as Milk thistle is a great support for the liver. Long with helping the body detox, this herb has been linked to reduction in certain cancers, reduced diabetes and even reduction digestive disorders. 20. Consume Essiac Tea, which cleanses the body and also has anti-cancer properties. This tea can help the body rid itself of pesticides used with GMOs, and ground-spraying including permethrin. 21. Eat your sea vegetables. Algin in seaweeds helps to absorb toxins form the digestive tract (in much the same way that water softener removes hardness from tap water) so they can be eliminated more easily. They also offer the largest range of vital trace minerals that can help to clean the blood. 22. Consuming dandelion greens and roots can help to detox the body due to their high levels of antioxidants but also help to support liver decongestion. 23. Use broccoli sprouts in your salads to ingest important substances that help with detoxification: sulphorophanes, indole-3-carbinol and D-glucarate. Sprouts also contain up to 20 times more sulfurophane than regular, full grown broccoli plants. 24. Eat flaxseed and flaxseed oil to help detox the body. This super food is full of fiber and Omega 3s, both important substances for detoxification. 25. Add turmeric to your recipes. This root is full of Curcumin, used often in Ayurvedic Medicine to treat liver and digestive disorders, and a great detoxing agent.